Forest and some friends from his pre-K class and from storytime at the library had a ton of fun celebrating his fifth birthday at the YMCA. Xavier, Olivia, Naomi, and Isaac, as well as some younger siblings joined Forest to play. Forest’s nine year old cousin Zane came too. It was nice having a range of children of different ages to play together. 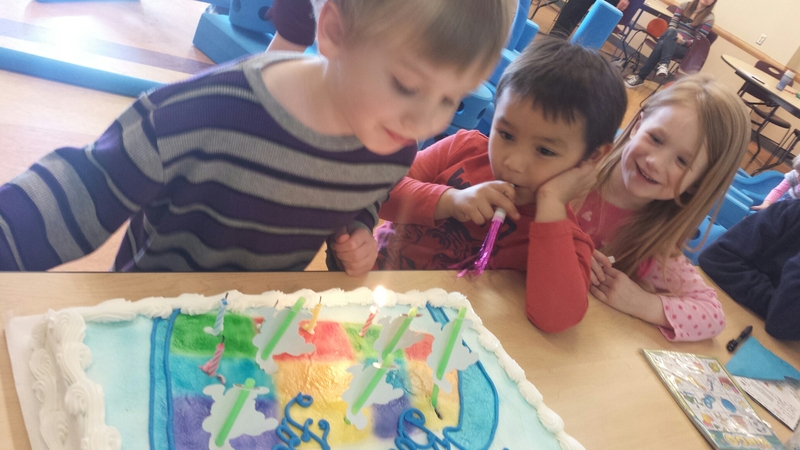 Forest enjoyed blowing out the candles all by himself this year. He designed his own cake. 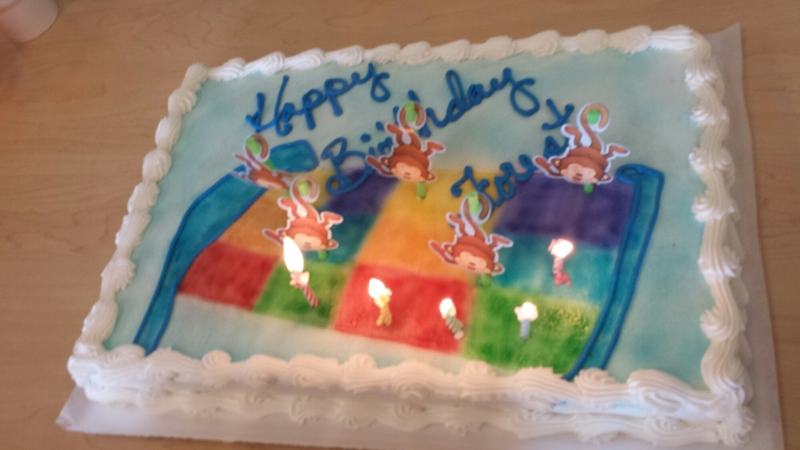 He told me that he wanted “five little monkeys jumping on a rainbow bed.” The baker I called was amused, but she took it up as a fun challenge. They did a great job with the cake. A wind storm caused a brownout last Monday which damaged some of the pool features at the YMCA, so the pool was unfortunately closed for repairs. But the YMCA compensated by bringing out the Imaginarium giant, blue foam blocks for the kids to build with. They had a great time building large structures and playing with many colorful balloons. I wish we had gotten a better picture of the wild chaos of the party and the giant block structures the kids (and parents) built, but Donald and I were too busy hosting the party and chasing Rowan around to remember to take many pictures. A few more pictures from the party can be found here in his Dad’s blog for Forest. This entry was posted in Forest, milestones, photos and tagged birthday. Bookmark the permalink.